Home / News / Are you aware of these 5 workplace risks? Are you aware of these 5 workplace risks? Assessing risk within your businesses workplace should be a daily process. However, some businesses may only assess risks directly affecting their revenue, when in fact they should be assessing the risks exposed to the employees. Have you thought about what may be affecting your staff recently? Are you aware that work-related mental disorders are a significant concern for Australians? Approximately 7,500 Australians obtain compensation for such mental disorders, which equates to roughly 6% of workers’ compensation claims (Safe Work Australia, 2018). These mental disorders are strongly defined by various factors; however, one major factor is the stress in the working environment. Stress commonly results from poorly designed or managed workplaces and the mental, the emotional and the physical demand of the work. 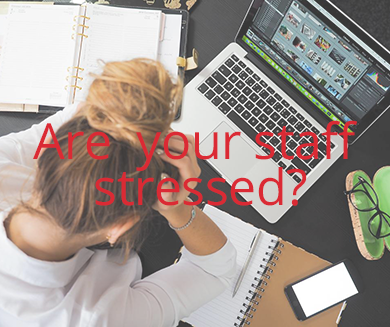 This stress interferes with the employee’s productivity and performance, as well as their mental state of mind. In order to mitigate the negative impacts stress can have on an individual and company, can set clearer goals, offer a flexible working environment, encourage mindfulness, encourage physical movement and provide recognition. Do your staff breath in poor air? Are you polluting your working environment? Indoor air pollution, whilst having negative impacts, is not uncommon in most workspaces. With most workplaces requiring most employees to be indoors to perform their tasks, the importance of quality air ventilation is significant. Pollutants within the air can increase the risk of illnesses and are a serious environmental health issue. In order to mitigate the pollution within the air, you should be able to control the air quality. One strategy of doing so is to identify the source of pollutants and either remove them if possible or isolate them from the staff. It is also possible to dilute pollutants and remove them from the environment through the ventilation. Another option to mitigate these risks is to incorporate a filtration system to clean the air. 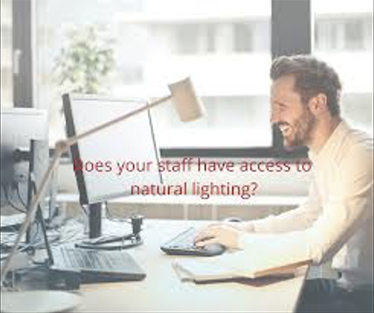 Does your staff have access to natural lighting? It is not unknown that having access to natural light improves mental and physical health. Employees who do not have access to natural lighting are more likely to be less physically active, less productive and also result in a negative state of minds. Incorporating natural lighting into your workspace will mitigate any negative effects and boost productivity and workplace morale. Harnessing natural lighting is as simple as installing windows and skylights upon the planning and construction of an office. Workplaces should also encourage breaks to be taken outside when possible. Is your workplace producing excessive noise? Noise within the working environment can be caused by loud discussions, constant movement, use of machinery, use of office utilities and much more. The potential negative impact of excessive noise can be the loss of hearing, interference in communications, reduction in concentration, fatigue, agitation, depression and a diminishing in the immune response. Eliminating excessive noise in the working environment can be done via many different strategies, depending on the type of working environment it the nature of the noise. Implementing noise friendly flooring, having a ‘library’ or quiet space, controlling background noise, and having sound friendly furniture. Has your workplace incorporated ergonomics? Not all workplace injuries are a result of a specific incident; poor ergonomics result in muscular fatigue and discomfort. Within the workplace, it is important to recognise the benefits of good ergonomics and incorporate them where possible to mitigate any lack of productivity and staff injuries. Providing keyboards to allow wrists to be placed straight, chairs which have adjustable heights and backrests, headsets for phones and eye level computer monitors are a few of the basic factors which can mitigate the risk of bad ergonomics. Of course, there are various risks within the workplace which need careful consideration in order to mitigate or prevent its negative impact on the business and the staff. Learning how to avoid and handle these risks is critical to the productivity and staff retention of your working environment. Contact Wurkspace 7 to find out how we can mitigate these risks for you.